When I first saw the information about Andy Skinner's workshops "Book of Ruination" and "Rock Your Book," I really thought the projects were soooo strange, not my style AT ALL. Yet, the images kept calling to me, and I KNEW I'd learn some great techniques if I signed up, and that's what happened. 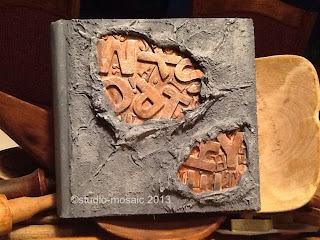 The book that I "rocked" was from a larger book cut in half.....I didn't realize until my cover was underway that I was doing it upside down, but I will be painting and tearing out pages anyway. I used so many interesting techniques to finish the book; another project is checked-off on my creative path this week. It's been a delightful week of creating and learning. I TRY to clean up my studio, but then I stumble on something that triggers a new idea, and I'm off and running again with some new project. SUCH FUN! My mind is spinning. Hope you enjoy how I "rocked my book" shown in this image. A link is on the right of this blog to "The Book of Ruination."